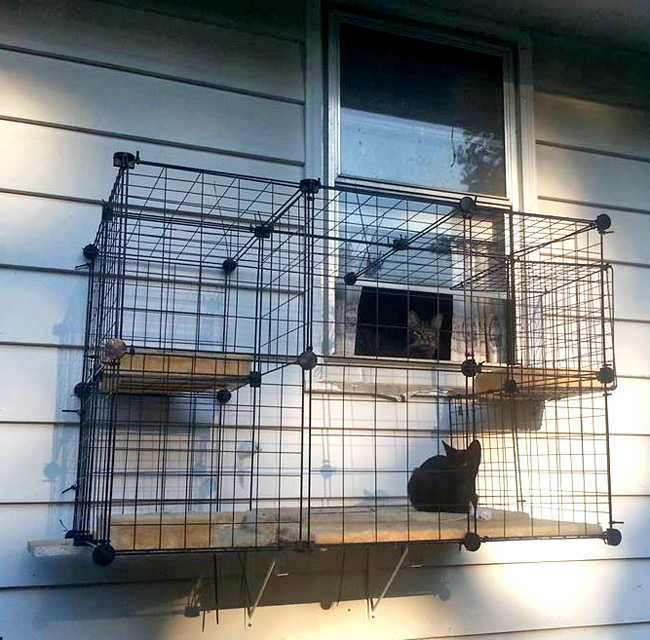 catioblog | Ideas for catios, safe outdoor spaces for your cats! I have pinned this post to the top of the page so the instructions are always easy to find. If you are interested in the other blog posts please use the menu of recent posts on the right. These pages originally written and compiled by Karen Horne between 2011-2014 for CatandCaboodle.com (defunct). Karen kindly passed copyright to me in order to keep this valuable information accessable. Thank you so much Karen for allowing me to maintain this information! Photos remain the property of their original submitters. Photos and text may not be published in whole or in part without permission. Please link to this page instead. 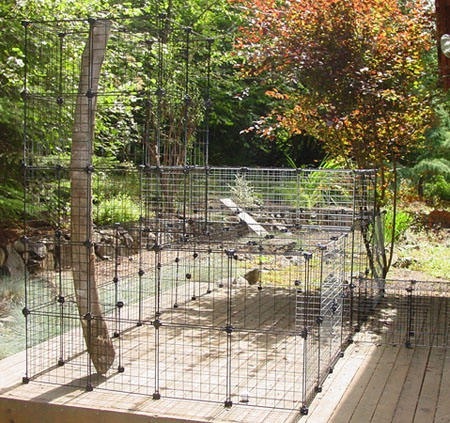 NOTE: If you own your home and have a smaller, fully-enclosed fenced yard, instead of building an enclosure you might consider this alternative from “http://catfencein.com/Cat Fence-In. 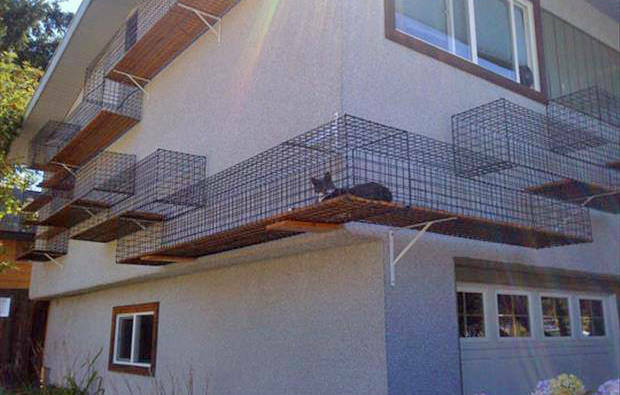 If you’ve shopped for outdoor cat enclosures, you know that they are expensive. Building one yourself is complicated (even with plans) and requires tools, and still there’s no guarantee that the materials alone won’t cost as much as if you’d bought a kit.We thought of buying a http://www.kittywalksystems.com/, but even they are expensive for the kind of area we wanted to use for our cats. The limited vertical space of that system got me thinking, though: if cats can be content with such a limitation, why can’t I just make one out of materials with which I’m already familiar? 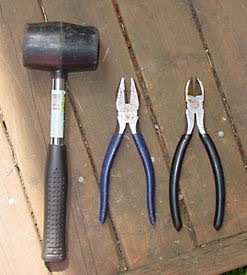 Wire cutters/dikes/diagonal pliers (all terms for the same tool)…and that’s it. 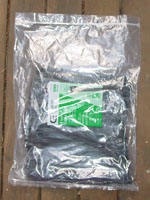 1 bag of 1000 7″ or 8″ cable ties (also called zip ties or tie wraps): $20 at home improvement stores. For smaller projects, 3 bags of 100 ties each might do, but after that you’re not saving money by buying the smaller bags. Besides, cable ties – like duct tape – have an infinte number of uses. Having leftovers is a great thing. There are no directions, but I have many tips for you. Access: Determine how your cats are going to come and go into their new outdoor playhouse before putting it together. If you need a panel with a cat door in it for a door or window, that will cost you more than the enclosure itself (we had to buy and install an all-weather panel to fit against our sliding-glass door). 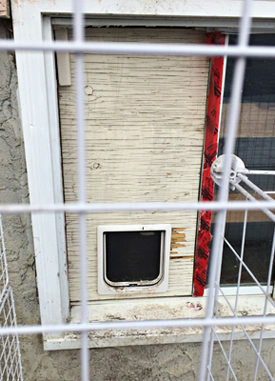 Cutting a hole through a wall and installing just a cat door is much cheaper, if you’re handy or know someone who is. Finally, in the pleasant-weather months, if you don’t need or use air-conditioning, and have a sliding screen door that you don’t mind butchering, you can cut a 14-inch square hole in one lower corner of the screen door, close the screen, and allow the cats to come and go through their 14-inch opening straight into the enclosure. Design: The 14-inch square panels are strong, and so are the connectors, but I wouldn’t advise building an enclosure that’s more than 4 or 5 panels high, and your cats won’t need something that tall, anyway. The one I built has several sections to it, but the only section that’s more than 4 high is one on the end to accomodate a tree limb for climbing, and that section is only 2 panels square. If you’re already familiar with this product but haven’t purchased it recently, you should know that they’ve changed it so that some panels have 8 wires across and some now have only 4. It doesn’t matter which you use where, since even the ones with only 4 across still leave a hole too small for a cat to pass through. If you’re ever going to have kittens in your enclosure, though, be sure to use only the 8-across panels on the ground level, as a kitten can easily walk right through the 4-across panels. 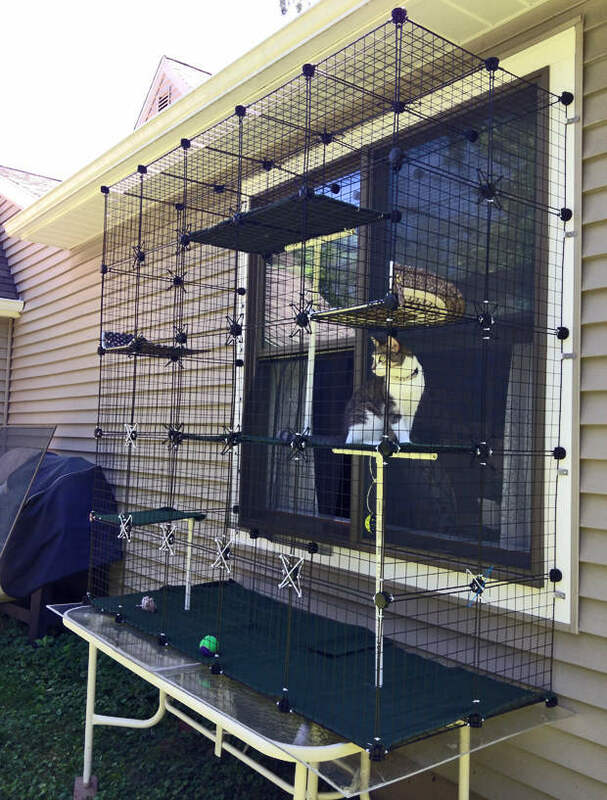 If you’re going to build a run instead of an enclosure (as in the Kittywalk system), your cat will be happier if you build it 2 panels high (28″). 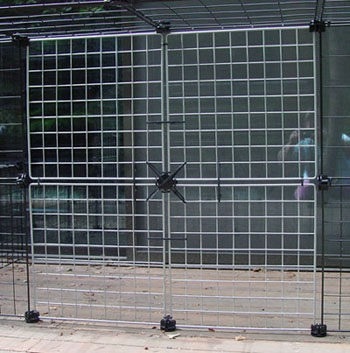 Don’t put a bottom on your enclosure – your cats won’t like trying to walk on wire mesh. 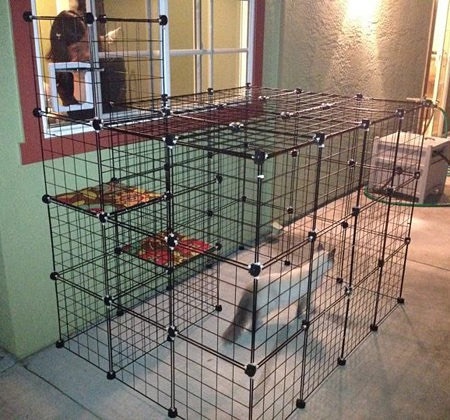 The enclosure can sit down directly on a deck, patio or grassy area, and its own weight will keep it from moving much (although it can be picked up and moved by 2 people). Your cats will not be able to crawl underneath, unless this is put directly on soil and you have a digger. Construction: Your mallet will come in handy for tapping the panels into the connectors securely, squaring up sections that need it, and is pretty much mandatory for removing connectors from groups of panels that have already been joined. The nice thing about these materials is that you’re free to experiment and make mistakes: if you don’t like what you’ve done, just cut the tie wraps, pull it apart and start over. What makes this so sturdy is the addition of the cable ties. Wrap a tie around every joint (every place corners of two or more panels meet) next to the connector. Pull them tightly using a pair of pliers, or your hands if you have gloves (one or the other is necessary; they’ll chew up your hands pretty quickly otherwise). Once you have the ties tightened, cut off the remaining portion with the wire cutters. I was careful to face all of the cut sides outward, as the cut ends can be very sharp, and I didn’t want them as a hazard to my kitties. 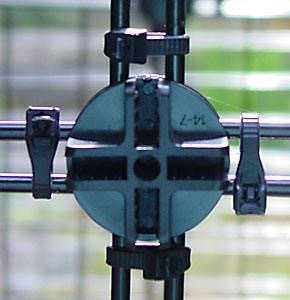 Thus, the joint you’re seeing in the photo above is facing the outside of the enclosure. You may be wondering why you were told to buy such long cable ties when you’re cutting most of the tie off. The problem is that the smaller the tie, the less tensile strength it has. 7-8″ ties have a tensile strength of 50-75 pounds; the shorter ones have considerably less. The Access Panel: You have to have a way in yourself to add goodies for your cats to lay on and play with, and to get them out when you need to and they don’t wanna (although luring them in with a treat is easier!) This is solved by making a 4-panel section be removeable. Because it can’t be permanently tied to the rest of the enclosure, you have to stabilize this 4-panel section with cable ties. This was how I did it. (For the longer ties, notice that I cheaped out and tied two or three to each other to make one long tie, instead of buying longer cable ties.) The resulting panel will flex but won’t come apart, and it attaches to its “wall” by only the two top and bottom “feet”. You’ll have to play with this to see what I mean, and to decide what will work best for you. Make sure it will attach to the rest of the structure at 4 points, but not so securely that it’s difficult to remove. This joint has its connector with the smooth side facing the access panel, instead of connecting to it. 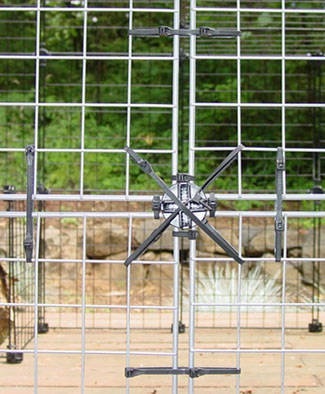 The access panel’s wire panels are connected on the sides only by tie wraps. 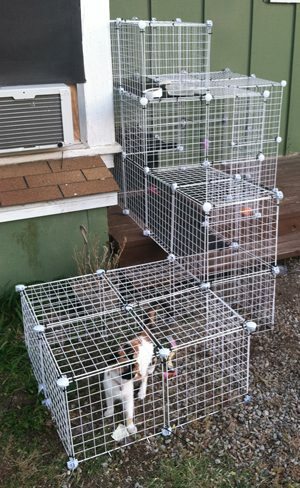 2011: Below is a photo from Diane, who built her own enclosure following these tips. If you build your own and would like to send us a picture of it, we’ll post it here. To the left is a photo from Tim in Colorado. To give you an idea of what a small one like this would cost, he used only 3 boxes and got them at Target while they were just $12 per box (check for sales on these around the time students are going back to school). Wisely, he bought extra boxes at that price, so he’ll be able to expand this later if he wants to. 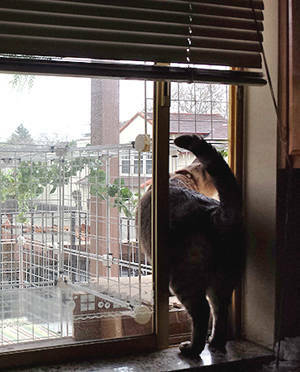 His cat access is a pet door he installed into a screen (great, inexpensive idea). You can get relatively inexpensive pet doors/flaps at Petco and PetSmart. 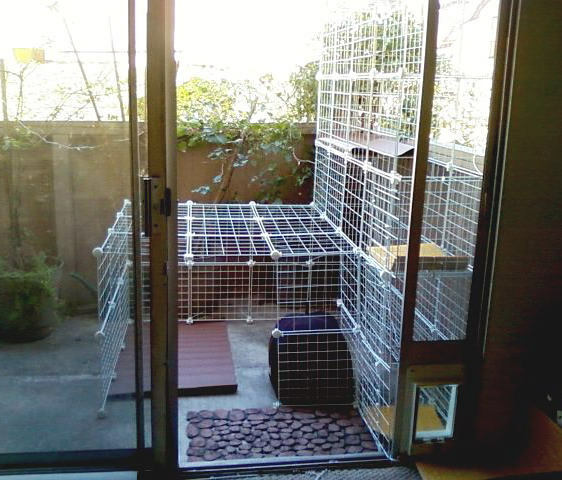 For the solid portions you see here, which his cat needs to walk and sit on, he used more wire panels and covered them with carpet padding (plastic shelving would be more weatherproof). 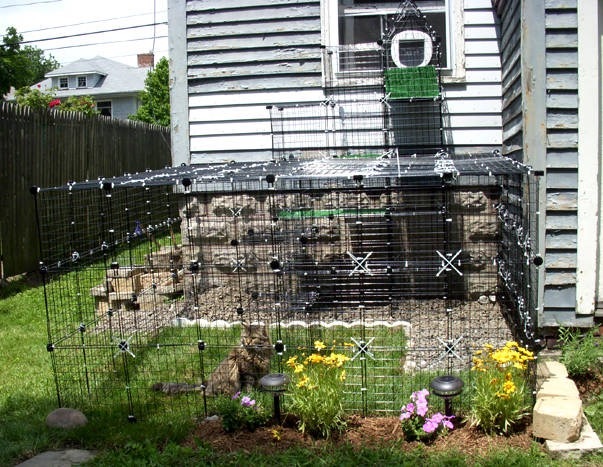 He used cement pavers for the bottom of the enclosure, and extended it out to cover some of the lawn so his cat could enjoy lounging (and nibbling) on greenery. 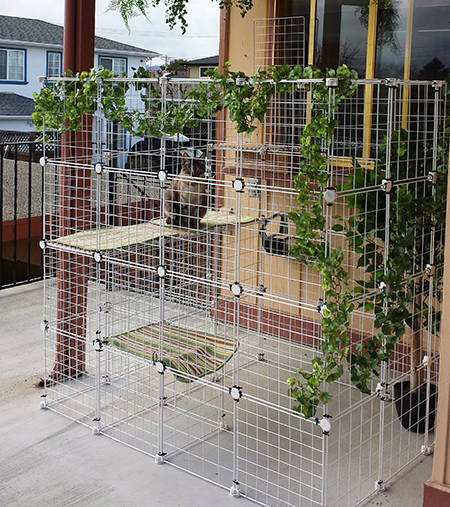 Unless your enclosure is completely under a covered porch, like Diane’s, definitely think about making any other materials you use and items you put in your enclosure weatherproof. 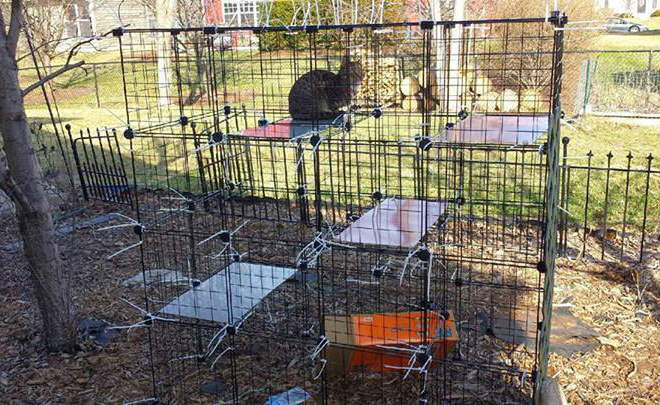 Your cat will not stop wanting to use his or her enclosure in the winter. Ours go out in both snow and rain. 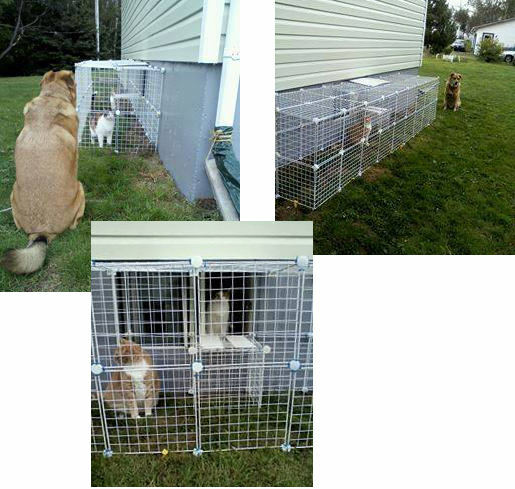 2012: Jennifer from Calgary, Alberta sent us the photos below of her own “catio” (I love that term! ), showing how easy and non-destructive this solution can be if you already have one of those screens with a little door which allows you to open the window behind it. Jennifer got her wire cubes from Walmart for CAD $20 each, making this whole project only CAD $100. 2012: To the left is a photo from Andrew near San Jose, CA. This enclosure cost him only $100. 2012: Marilyn posted this photo to our Facebook page. 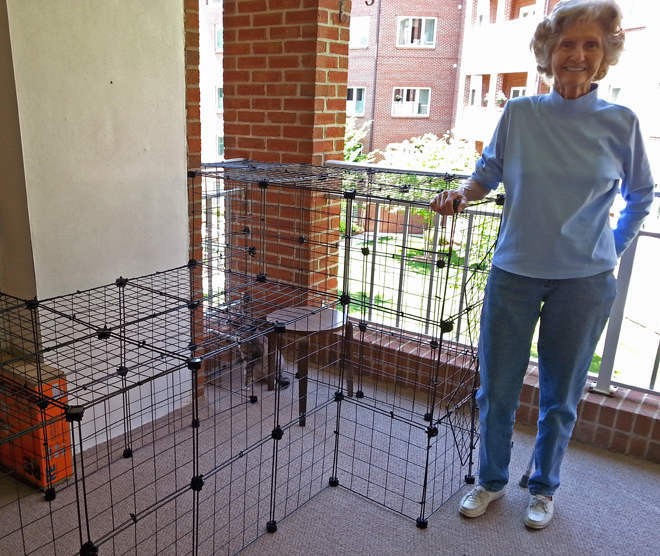 For the cost of only two boxes of cubes, she was able to make a starter “catio” accessed from a basement window. Her lovely Calico can get a taste of the great outdoors while she slowly expands the enclosure, if she chooses. If you have big dreams but your budget is tight, you could conceivably create a very large enclosure by just buying a box or two of cubes a month. 2012: Tudor from Portland, ME sent us the wonderful photo below of how an enclosure was created to fit into a corner of the house, from which this long-haired beauty can enjoy the cool grass. Here’s Tudor’s own description of the building process: “It took 10 of the 4-cube packages and a ton of cable ties. I made the stairs sturdy by building them as 6-sided blocks, burying them in a couple inches of rocks, and attaching them to the rest of the structure. I added a support ‘beam’ near the middle to keep the roof from sagging. Adding the (prefab) cat door to the window screen was relatively easy, but required cutting wire pieces to connect the structure to the window. To do this, I used the same type of wire square, which I cut to size using wire clippers on the interior of the grid. To cut the thicker outside edges, I scored them with the clippers, then fatigued the metal by stepping on it. I made the triangle piece for the front of the roof in the same way. I used some inexpensive, sold-by-the-foot astroturf on the ‘stairs.’ Thanks for the great ideas, Tudor! It might be hard to envision everything your project needs before you begin building, but once you start putting the cubes together tons of ideas will make themselves evident to you. And if you don’t like how it’s turning out, simply take it all apart and start over! 2012: Terri from Pennsylvania sent the photos below of the elaborate run she created to take advantage of all the space she could. It uses 5-6 boxes of cubes from Target and includes hanging toys and things to climb on (and in!) for interest. 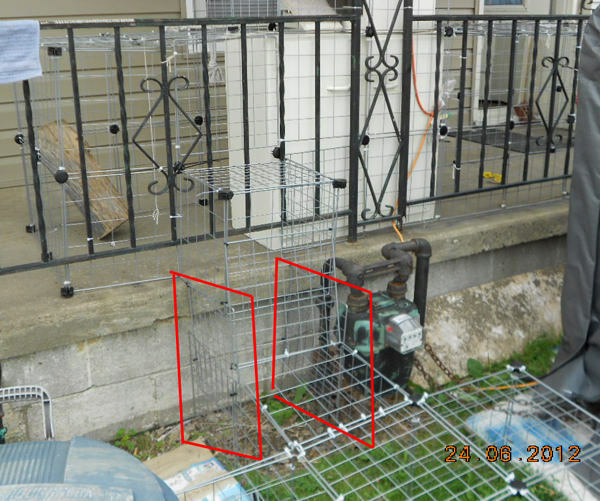 These photos are important for another reason, as they show what you’ll need to do when building a run that has to conform to different ground or floor levels (see red boxes in photo below). As I mentioned on the previous page, I remade our original enclosure into a run which came down off our deck. 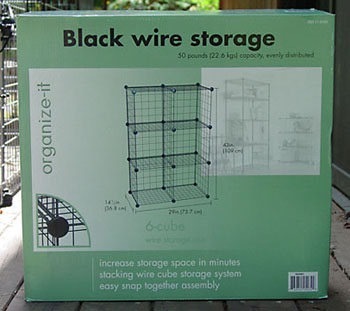 It also uses this method of overlapping and zip-tying the wire panels (without connectors) to fill in the gaps left when your second level isn’t exactly 14 inches from your first…which is always. It’s admittedly not pretty but it works and, thanks to the zip ties, remains strong and secure. 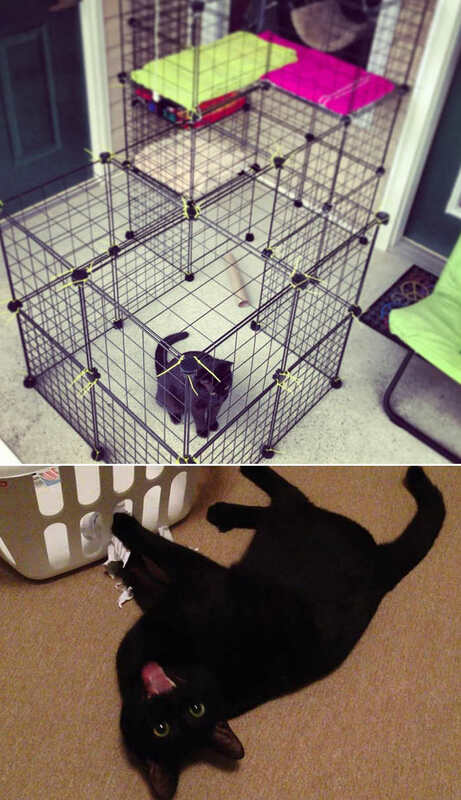 The inset photo above shows how Terri later remodeled the portion on the ground to be two panels high, after she discovered something that bears repeating: it’s important to make sections you expect your cat to spend any time in be a minimum of two panels high. They don’t need to be any higher than that unless you absolutely must make use of all the vertical space you can (in which case you’ll need to build in platforms or shelves so your cat can take advantage of it, too), but a cat cannot comfortably sit up in a section that’s only one panel high. 2012: After Shaina from Kansas found her outdoor cat inside a neighbor’s raccoon trap, she knew something had to be done to keep LuLu safe. Using our tutorial, she constructed the enclosure below. Shaina rents and cannot make any doorway to the enclosure for LuLu, so she has to put her inside it. To facilitate this, she left one panel untied, and just removes it and replaces it. As you can see, there’s a bed in there for LuLu, and toys to keep her occupied. Much of the structure is under the cover of the porch so even when Shaina isn’t home, her cat will be safe from the elements. Shaina also used some inexpensive rubber mats (great idea) to provide seating on the shelves, and also to block off a portion of it for further protection from rain. Shaina’s looking for a new place to live, so the portability of this solution is an added bonus, since she’ll be able to disassemble and reassemble it to take advantage of her new space when the time comes. Shaina tells us something we thought we should mention: LuLu hates this “cage”. 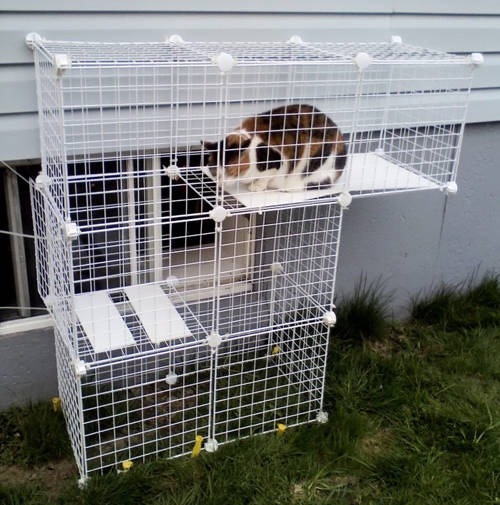 Almost all cats who are used to being able to run free outdoors will not be happy with this or any enclosure you build for him/her, at least at first. It helps to be forewarned that a lack of appreciation is something you might have to deal with. 2013: Our first submission for 2013 comes from Tania in Lakewood, Colorado, who reports that their new enclosure makes Ginger and Jake “happier than ever”. And they do look contented in this attractive configuration with two seating areas, don’t they? As you might have guessed from the photo, the cats get into the enclosure via the window. Tania decided to use only the panels with the 8 wires across because she discovered that with the panels with only 4 wires, one of her cats could get both his head and a front leg out at the same time, so she was afraid he would get stuck, or possibly escape. 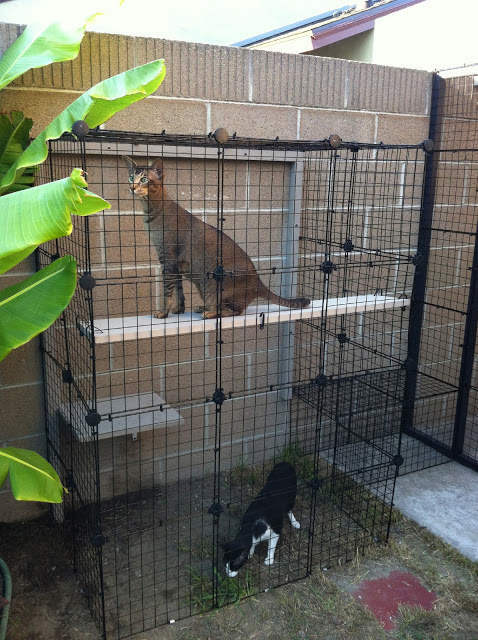 I hadn’t heard of this with an adult cat before (and one of our cats is quite small), but since we now know it’s possible, you’ll want to watch your cats in their new enclosure for awhile to see how they react to it. 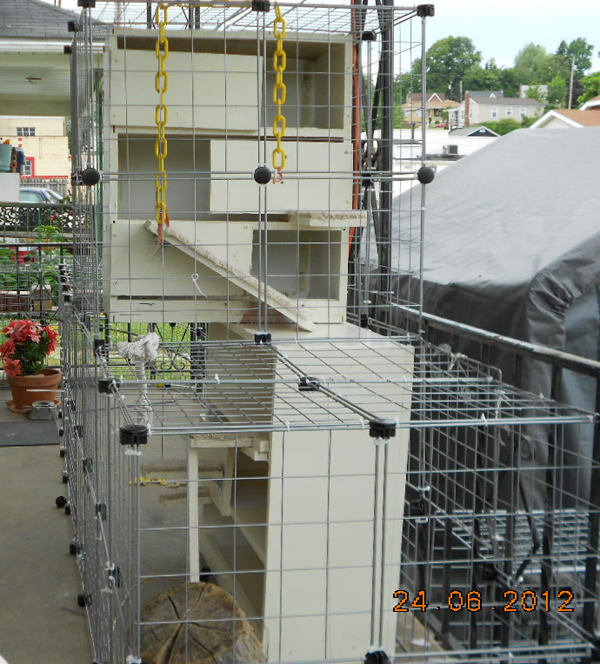 2013: Carrie from California posted the photo below of her nearly-completed enclosure to our Facebook page. As you can see, it’s built to fit into an enclosed patio. 2013: Kerstin from North Carolina built the enclosure below using about 2-1/2 boxes of cubes that she bought from Target. Salem was used to being able to go out before he came to live with Kerstin in her apartment complex, and if you’ve ever had the experience of trying to make an outdoor cat into an indoor-only one, you know how insufferable a cat can be when he WANTS TO GO OUT. But Kerstin says Salem loves his new catio, and you can see what a character he is in the bottom photo, which is from Kerstin’s Facebook page. “I constantly marvel at the ingenuity and creativity of our readers, who are so resourceful in adapting the flexibility these cubes provide to the needs of each individual installation. Also, Sue noted what most others have, which is that she probably should only have built the structure 4 panels high. She found that after 4 panels, her enclosure started to become less stable, and Siri is just not interested in the higher levels. This is something we’ve found to be universally true, regardless of your cat’s fondness for higher levels inside your house, so as your particular installation allows, you are better off building OUT rather than UP. I now really regret that our original photos show the first incarnation of our own enclosure, which we later remodeled into more of a run because our cats were not interested in the height, either.Sue’s method for giving Siri access to the outdoors was particularly inventive and non-destructive, if you happen to be a renter: She removed the window screen and replaced it with fiberglass screening attached to a tension rod! 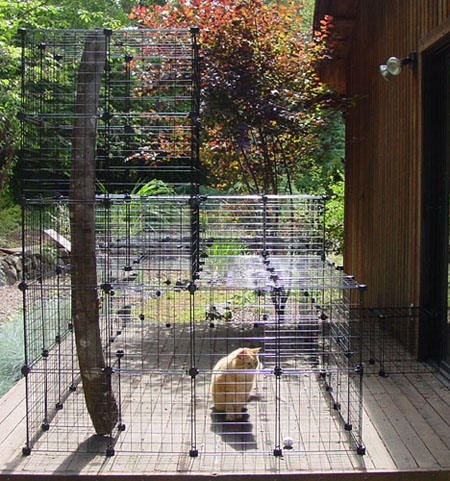 Keep in mind that your cat will still want access to his/her enclosure in the winter, so if anyone comes up with a good, inexpensive way to make this type of access weather-proof, we’d love to hear it. So far, the only winter-safe access points we know of are either destructive or expensive. 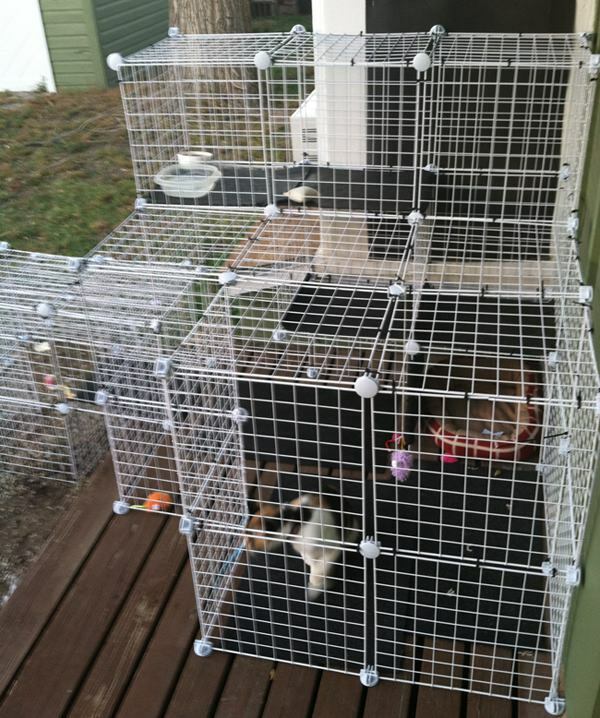 2013: Here’s a tall order: How can a 60-year-old arthritic lady on a fixed income afford her own outdoor cat enclosure? Well, KrisAnn from California planned and built this entire enclosure by herself, over several days, and feels justifiably pleased at the outcome. She started by putting some old cat trees outside under the eaves of her home (which also function as stairs for the cats to come and go through the window) and building around them. KrisAnn could not find these cubes at any local stores, but discovered that not only does Bed, Bath and Beyond http://www.bedbathandbeyond.com/product.asp?SKU=16719773” have them online, but they only charged her $11 to ship 6 boxes. (Obviously, this link may not work after 2013, and the shipping price may be quite different after that as well.) For the cats’ access to the enclosure, she bought something I’ve never seen before (isn’t the internet marvelous?! ); a “pet screen door”, expressly for installing into an existing window or door screen. It’s ridiculously inexpensive and extremely simple to install. She purchased hers from http://www.discountramps.com/pet-screen-door.htm Discount Ramps.com. Their product page has all the information you’ll need, including the PDF of the 3-step installation instructions. All the materials, including shipping, for this whole set-up cost her exactly $162, and she reports that her 6 cats are absolutely thrilled with their new play space. Right now, Brandi has to open a window to allow her 3 cats access, and they’re not subtle in their demands for that window to open! 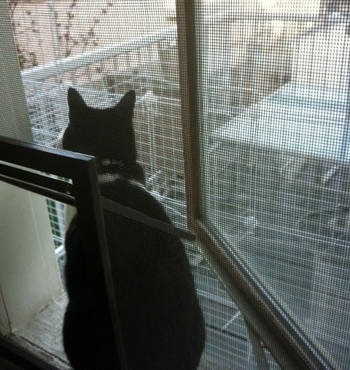 So there’s no question about how they feel about their new access to the fresh air, but as it turns out, even her neighbor loves it: She enjoys looking out her kitchen window every morning, watching the cats play. 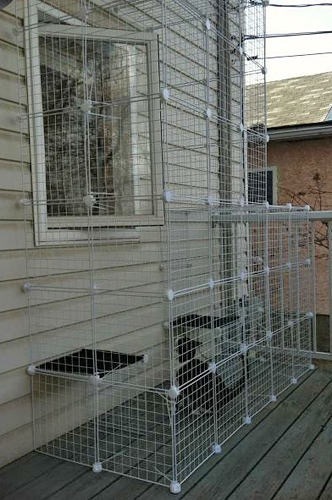 2013: Marilyn from Nova Scotia, Canada says of her new cat enclosure, “They can come and go all day and I can close the window at night, so we don’t receive unwanted visitors.” It looks like access to the enclosure is from a basement window. 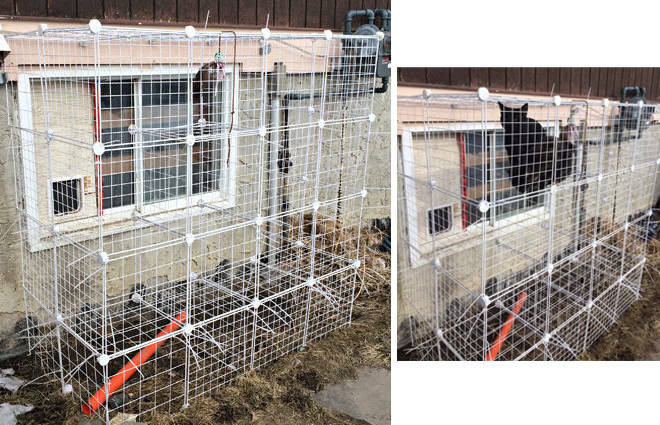 Cathy lives near Calgary, Alberta, and set up her outdoor enclosure when her kittens, Vader and Ivy, were only 6 months old. Ivy could still squirm her way out of it, so she locked the door and tried again later. On the third attempt, they both were too big to escape from it, so now it’s open year-round. In spite of some bitterly cold winters, her cats still use it in all weather. Cathy keeps the cold out of her house by having the enclosure access in her basement. 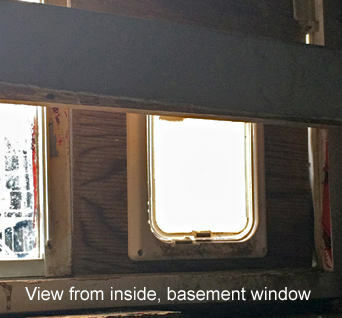 Since it didn’t have to be pretty, she also reduced the hassle of installing a cat door by simply fitting some plywood into an always-open sliding window, and installing the door into the plywood (great idea!). This would also work with a double hung window. We both had spent weeks on various ideas and searching the ‘net and we just couldn’t find anything that was suitable and reasonably priced. One day I was surfing the ‘net and your website caught my eye. I nearly jumped off the sofa! This idea was a snap and we knocked it out in about 3 hours. 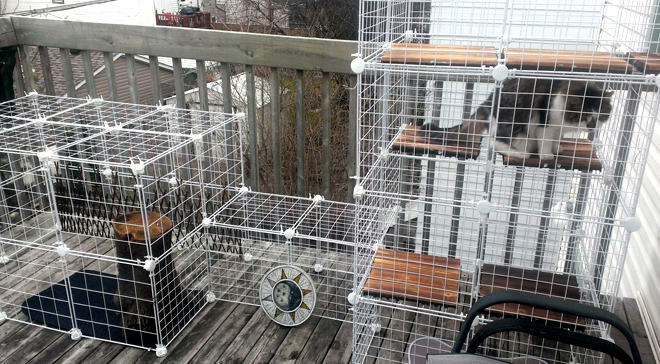 2014: Hannah from Chicago posted this photo of her catio to https://www.facebook.com/CatAndCaboodle our Facebook page. They built it between two trees in their yard. The plastic used for seating has been secured with zip ties to the wire so it will not slide around. She writes that her cat, Kimiko, wanted to be outside with them when they were doing yard work (“Why are the DOGS allowed out but I’m stuck in here? !”), and now she has her wish. 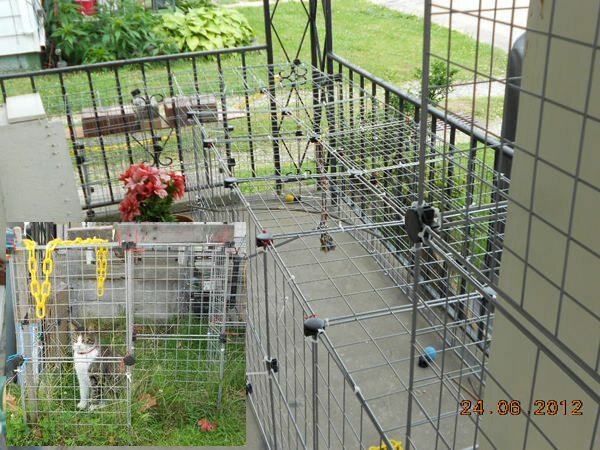 2014: Carole Anne from Ottawa, Ontario built this lovely, rambling enclosure on her deck for her cats Junior and Zena. 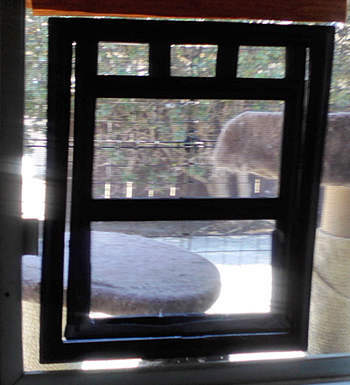 A friend with shop tools cut the wood piece to fit in her window frame, into which was installed the cat door. And here’s a big bonus we haven’t heard of before. Carole Anne writes of her gorgeous longhair, “Junior is no longer bored, so he hasn’t been waking me up at night for the first time in a long time.” How’s that for a big benefit! What a dreamy place for her little stinkers! Meg from http://www.feralcats.com contacted me about this upcoming tour in the Portland, Oregon area. Read below! I wasn’t sure how many of your followers were in the Portland, OR area, but thought it may be of interest. We’re hosting our 6th annual Catio Tour event in September and we’re calling catio host submissions currently. Our tour has inspired Seattle, Santa Cruz and Austin to start their own tours – it’a craze that’s catching on. Does your kitty frolic in a catio? Want to share this special space with the cat-loving, Portland community? From functional to fancy, all submissions in the Portland metro area are encouraged! The Catio Tour is pawsitively pure Portland fun. 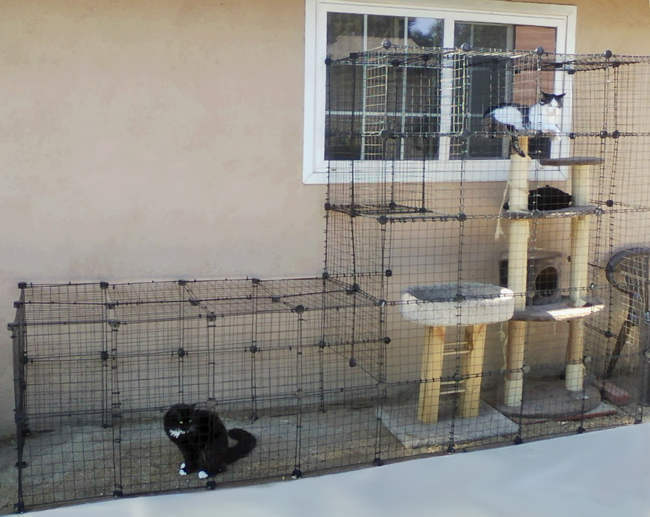 Even better, this one-day effort will raise awareness and excitement around the catio craze, directly resulting in a safer environment for cats and birds! Tour information for Hosts: One day event on Saturday, September 8, 2018 from 10am – 2pm. Hosts need to be present throughout the tour to answer first-hand catio questions from curious guests. Volunteers and staff will oversee set-up, guest check-in, and be on hand to provide Tour and Program Information. This tour promotes the Cats Safe at Home Campaign founded by Audubon Society of Portland, Feral Cat Coalition of Oregon, and the Animal Services of Multnomah & Washington Counties. The first incarnation was small and tall, but my daughter found that the kitties wouldn’t use the tall side unless bribed. So then we took that end apart and added some more panels to extend it along the wall and onto the lawn a little. The kitties now have an actual cat door installed in the window opening that they have no problem with. So, it’s only 2 levels high, and they use it in the winter, too. The only issue is snow blowing in sideways! This is in British Columbia, Canada. Oh, the levelling boards are hidden by the greenery later in the summer! The shelves are 1x6s attached with zip ties. The roofs are corrugated plastic secured with zip ties. They are to keep rain out of the window and off the cars and for shade. They are on an angle so the rain runs away from the house. 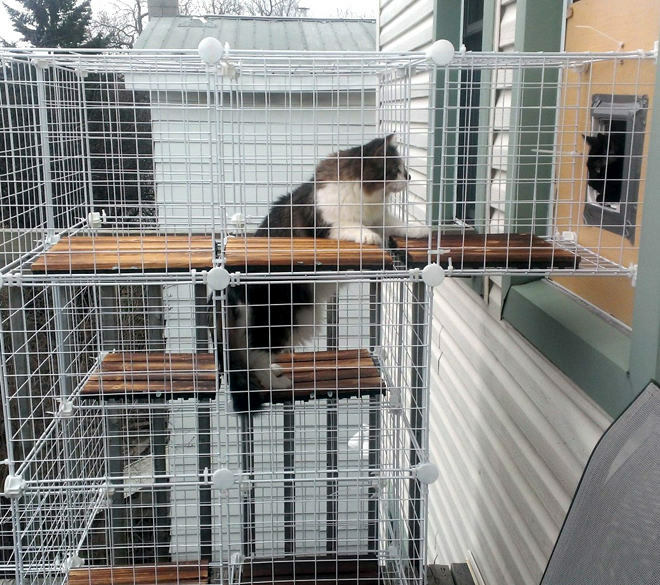 The catio is secured to the window frame with fence staples and zip ties to the railing, and with tent pegs where it has an open bottom on the lawn. You do want to wear gloves to do up all the zip ties and have pliers to tighten them well! 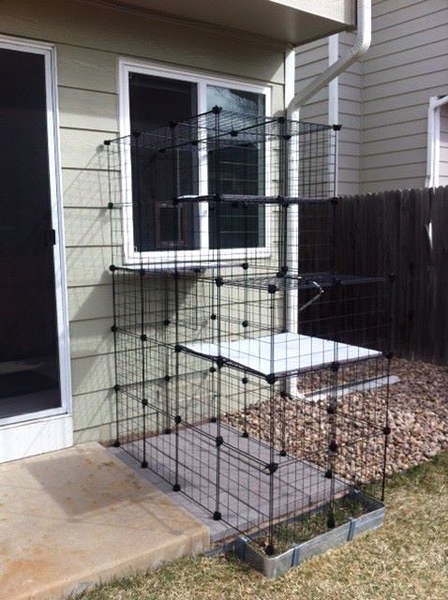 Feel free to use any info to help other catio builders. Pearl and Marsten love their catio! Jan, I love how they have that grassy area and also the planter boxes at the bottom. This looks fantastic for them and I am glad they are enjoying it! “I thought I’d provide an update on how the catio is going – best thing to ever enter our (or really just Pecan’s) lives! 1) stand on my chest and nibble my hand to wake me up. Even on chilly fall mornings like today (53F) she wants nothing more than to sit up on her perches and spy on the rest of the courtyard. Sparrows like to nest and roost in some cut-outs along the wall where her enclosure is, so that keeps her occupied for a long time. Her other favorite are when the crows show up. Had some leftover carpet and scrap wood from a project so we upgrade the platforms from the boring old cardboard that used to be there. Hung a few (still unused) toys from string, and here we are. Still dreaming of ways to expand but I don’t think the leasing office would be too thrilled! Anyway, thanks again for this resource – has really changed our lives. Kevin, I love your morning ritual and it sounds somewhat familiar, at least the nibbling part to get the human to wake up and put food out. Below is what Barbara submitted through email. Thank you so much for sharing with the blog! “I had been seeking some way for my indoor cat, and his Malti-poo friend, to use my deck. The costs to cat proof it were all rediculous. 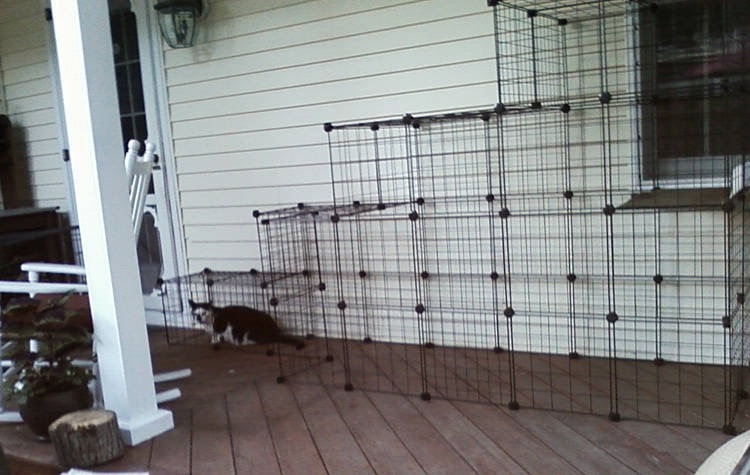 Then I found this DIY Catio. I built it with 4 boxes of 23 panels, purchased from Amazon.com at $35 each. I have 9 panels left over so I might enlarge it by 9 panels. I recommend adding a Channel Locks tool to the tools list. 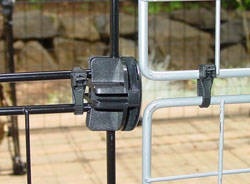 You can use it to pull the frames into the connectors, to remove a connector if you change your mind, and to open a tight bottle after the Catio is finished. I used nearly 500 wire ties as the pattern grew in my mind as I used the materials — I ripped back at times. There is a baffle around the top to prevent the cat from getting out. But I would have needed to build 4 panels high to walk around it in, so instead I have an open space for that. 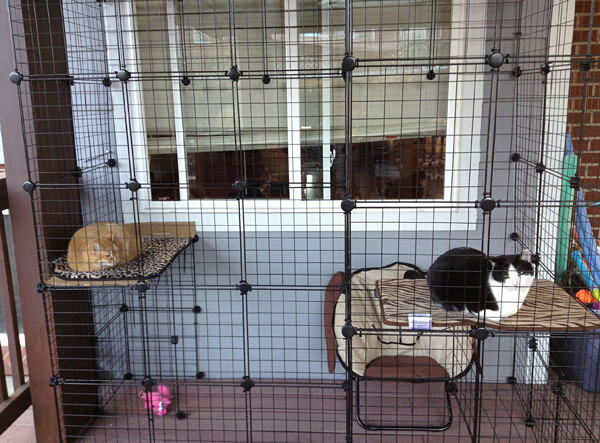 Every option to let the pets use the Catio at will was very costly. In the sliding door option I would have disabled my use of the deck. In the window option I doubted the little dog would have gotten used to using steps to get in and out. So instead I built baffles on the entrance so I just open the sliding door about 10″ and neither pet can go anywhere but the Catio or back into the house. The cat loves it. He had never been outdoors in his life. Being a cat he expresses his love by taking long naps. I’ve given him several platforms to do that. Zelda the dog is rather Meh! She would rather be sniffing around on the whole deck. The building process took me about 4 days at 3 – 4 hours a day. I tried to draw pattern, but found it easier just to create it as I went. I was contacted by a reader who happened across my blog. 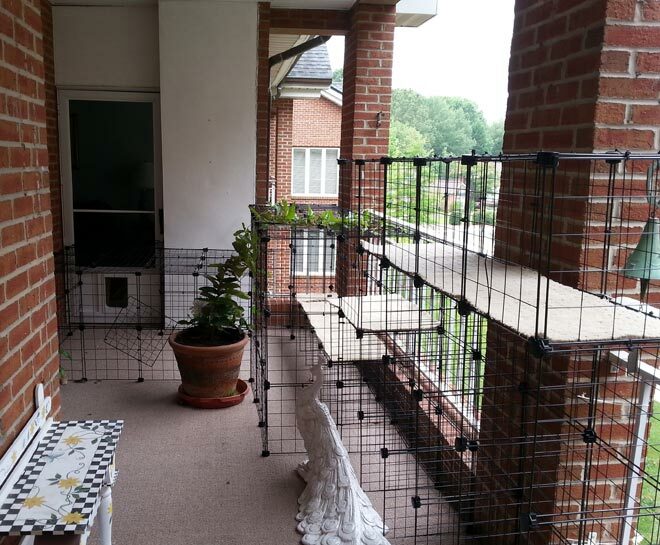 She was able to create a catio in no time at all AND was willing to send me pictures and to post her story. Thank you so much Sue! It looks awesome and your cat looks so happy.